At GTC Europe, Nvidia has unveiled a small amount of information about their upcoming Xavier SoC, which is designed to succeed Parker in the company's collection of products focused on autonomous driving and artificial intelligence. Nvidia is continuing to name their SoCs after comic book characters – Xavier is in reference to Professor Charles Xavier from X-Men – so there's certainly no shortage of names to choose from. Xavier is expected to improve on nearly every aspect of Parker, packing in a huge seven billion transistors on a die manufactured using TSMC's 16nm FinFET+ process. There's not a whole lot of information about the CPU and GPU configurations inside Xavier, but here's what Nvidia has announced so far. The CPU will be made up of eight custom ARM cores designed by Nvidia, possibly using a new design that succeeds Denver used in their Parker SoC. 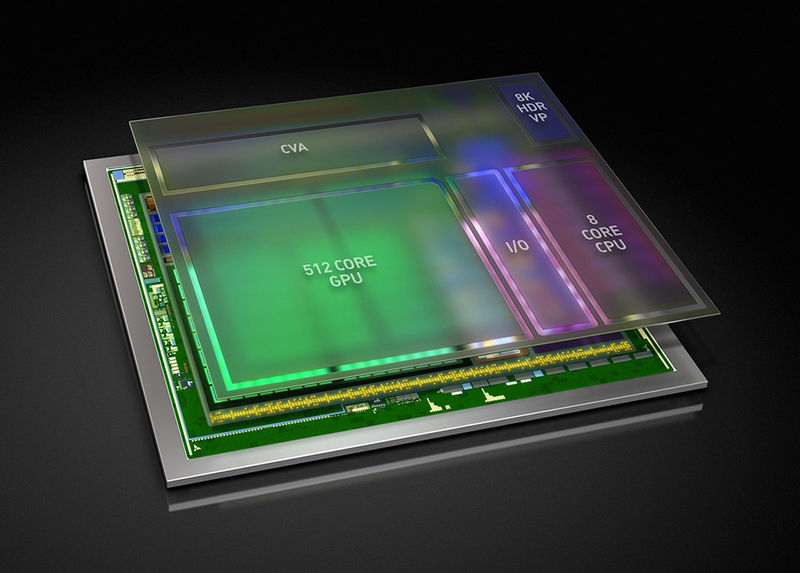 The GPU will use Nvidia's next-generation Volta architecture and pack 512 CUDA cores, up from 256 in Parker. Nvidia wants Xavier to absolutely crush Parker in terms of performance. The company is aiming for 20 Deep Learning Tera-Ops (DL TOPS) at a power consumption of just 20W, which is crazy when you consider the entire Drive PX2 board with multiple Parker SoCs and several discrete GPUs hits 24 DL TOPS at 250 W of power. It will still be some time before we see Xavier in the flesh, as Nvidia is beginning to sample the SoC in the last quarter of 2017 ahead of expected volume production in 2018.